Since its first publication in 1974, Principles of Structure has established itself at the forefront of introductory texts for students of architecture, building and project management seeking a basic understanding of the behavior and design of building structures. 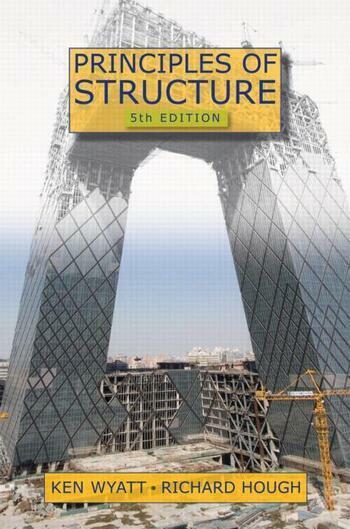 It provides a simple quantitative introduction to structural engineering, while also drawing connections to real buildings that are more complex. Retaining the style and format of earlier editions, this Fifth Edition brings the text and examples into alignment with international practice. It also features six new buildings from around the world, illustrating the principles described in the text. The book begins with a chapter explaining forces and their effects. Other chapters cover ties and struts, loadings, graphical statics, bracings, shears and moments, stresses, deflections, and beam design. There is also an appendix with a fuller explanation of fundamentals for readers unfamiliar with the basic concepts of geometry and statics. The book offers a unique format with right-hand pages containing text and left-hand pages containing complementary commentary including explanations and expansions of points made in the text and worked examples. This cross-referencing gives readers a range of perspectives and a deeper understanding of each topic. The simple mathematical approach and logical progression—along with the hints and suggestions, worked examples and problem sheets—give beginners straightforward access to elementary structural engineering. Ken Wyatt was the mainstay of structural engineering teaching in the Faculty of the Built Environment at the University of New South Wales, Australia, for many decades. There he developed the original text of Principles of Structure. He is also a structural engineer, researcher, materials scientist, and heritage consultant. Richard Hough has worked as a structural engineer with the design firm Arup in London, Los Angeles, and Sydney on many well-known buildings and with some of the world’s best-known architects. He is presently a principal in the firm’s Sydney office, and a conjoint professor at the University of Newcastle, Australia.